When it comes to structures of any kind in the vast array of entertainment venues, whether permanent or not, and in particular when the need is for a specialist, bespoke service, Nippy Industries is a company which can provide exactly what is needed. Nippy Industries was started in 1998 by managing director Steven “Nippy” Williams, a former freelance production rigger who has experience ranging from high profile rock tours (including The Rolling Stones and Madonna), to lighting design, sound engineering, set design and set construction. After spending many years in the industry, Williams became increasingly frustrated by what he considered to be an inadequate and impersonal level of service, and decided that, with his knowledge and contacts, branching out on his own would provide him with the opportunity to set the record straight. 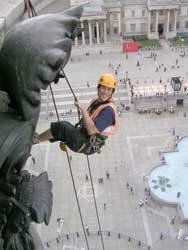 Steven ‘Nippy’ Williams testing the abseiling equipment on Nelson’s Column. Nippy Industries now offers staff fully trained in Rope Access up to IRATA 3 (Industrial Rope Access Trade Association), High Level Rescue, and services relating to Chain Hoists, Trussing, Staging, Counterweight Flying, Working at Height and Electrics, amongst many other skilled disciplines. Williams is highly conscious of the need for training, both in these industry-specific skills and, in particular, Health and Safety. He is currently on the committee developing the new National Rigging Certificate and was involved in the development of the Working at Height Regulations in 2005. More recently he has been invited to be part of the Advisory Committee to LOLER (Lifting Operations and Lifting Equipment Regulations) Rope Work forum on behalf of the Health and Safety Executive for the government. By increasing the level of training, he says, the industry can start to provide a minimum standard, enabling clients to have absolute confidence in the companies they hire for projects and allowing industry staff to promote their skills to potential employers. Ensuring clients have confidence in the business is of utmost importance to the company who actively work to achieve and maintain nationally recognised work standards such as Investors in People and ISO 9001. As a consequence, Nippy Industries offers not only standard off-the-shelf product and service but in addition, bespoke rigging solutions for a variety of different venues or applications, and they have been showcasing these services all over the world since the 1990s. As part of their Testing and Inspection service, Nippy Industries has completed a two-stage refit of the White Rock Theatre in Hastings (for Clear Channel Live Nation), starting with a complete safety analysis and installation of a new counterweight and winch flying system, improved access for grid work, and the installation of a new electrical winch system on stage and front of house. The second stage of the refit included major structural improvements to the roof, allowing faster turnaround time between shows with a much more attractive system for show production. Nippy Industries provided all relevant staff with full training on all newly installed equipment. The new equipment was custom made in Nippy Industries new fabrication and engineering workshop, where design specifications suited to each client can be transferred from the drawing board to real life. In another large refurbishment project, Nippy recently carried out a custom test and refit project at the Mumford Theatre for the Anglian Ruskin University. Here, they installed new fly bar winches and conducted some remedial works on the moving orchestra pit. 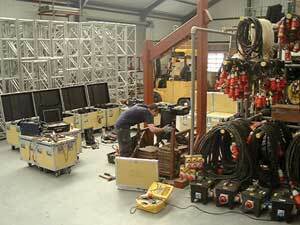 It is the bespoke service that the company offer which really makes them stand out as a specialist rigging company. This was demonstrated when the Royal Shakespeare Company approached them with a complex idea: for their production of Twelfth Night they needed to drop a boat, including cast, vertically into a scene without any visible cabling, harnesses or winches. Impossible you may think? Not according to Nippy Industries, who custom-built the boat, developed hidden safety harnesses, devised the mechanics of dropping the boat down, and, most importantly, trained the actors to become accustomed to working at height. All this was achieved in a remarkably short time, with the design and construction of the boat lasting late into the nights preceding the production. Actor training is not limited to specific productions; Nippy Industries regularly trains actors for the Royal National Theatre. Perhaps the company’s most impressive coup in the world of bespoke rigging is also their most recent. 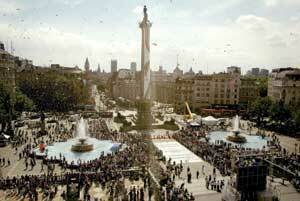 Remember the Olympic Bid celebrations in Trafalgar Square? Remember seeing a troop of people running down Nelson’s Column? 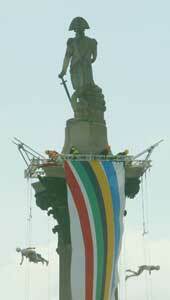 Nippy Industries was on top of it all, with Williams setting up rigging, testing the abseiling equipment, and devising the structure to support the massive flag which unfurled down the side of the column. The two main issues during this project were that no one actually knows the internal structure of the column, leading to the second issue: the impact of forces both from the rigging, but mainly from the unfurling of the flag, which acted as a large sail and exerted huge and fluctuating forces of up to 55kN into the column itself and two tonnes of weight on top. To overcome these challenges, Nippy Industries used Serious Light Duty trussing from top to bottom which was ideal due to its high loading spec but still a small less obtrusive truss. They had eight compression cables to compress the column, which was to avoid it tipping, and used a 120 tonne crane, 60m reach boom lift and Petzl climbing equipment to produce a magnificent show on the day. Needless to say, all high level workers were IRATA trained ranging from level 1 to level 3 qualification. All the performers were also trained for this show by the show crew off-site at Nippy Industries new facility in Cambridgeshire where the company has continuously adopted this process for all special events involving live performance at height. The company is actively looking at expanding this facility as rehearsal space. Apart from concentrating on specialist, bespoke project solutions, Nippy Industries also has a number of long-term contracts for permanent and temporary structures. 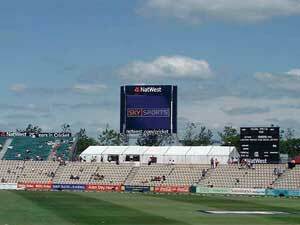 These include providing support structures for large screens at national Test Cricket and One Day International matches. They work on temporary structures throughout the UK and abroad with companies such as PSL, Event 360 and LED Screenhire to provide the equipment and rigging service needed to hang this type of equipment. 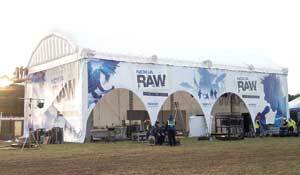 They provide the outdoor roof and stage system for the Kew Gardens Swing Festival, and have provided the outdoor roof structures at all the Nokia RAW Summer Festivals including Leeds and Reading (for the Dobson White Partnership). With all the above in mind, Nippy Industries is making strong headway in highlighting its bespoke service, and have recently appointed a new business development consultant, Matt Lloyd, previously of Stage Electrics, where he was responsible for establishing their presence in London having worked on over 300 West End shows and numerous festivals and UK tours. Nippy Industries will be at this year’s ABTT in June (Stand 110), exhibiting their recent and current projects, as well as the range of Verlinde and Kinesys products for whom they are stockists. Click on the buttons in the top frame to see news in scrolling format.